CJ Group is a Korean organization behind the largest cinema screen in the world and formats such as 4DX and now ScreenX. Back in 2009, they introduced a new technology involving moving seats, water, fog, and scent at their Korean theater chain CJ CGV. This April, over 500 screens across the world featured 4DX and it even inspired a rip-off. 4DX has since become a success, partnering with multiple theater chains around the world including Regal Cinemas in the United States. While some might perceive 4DX as a distraction, others enjoy the interactive movie experience. Now, CJ Group is bringing another one of its technologically innovative premium formats to American screens: ScreenX. Did you ever ask yourself “Why is a movie always in the center?” Well, CJ Group did, and in 2012 their answer was that the action can go beyond the center. ScreenX utilizes the right and left walls in an auditorium. That means that when you’re looking forward, you’ll see the actual movie; when you look to the right or the left, you’ll see images that are derived from the movie. So if you’re watching Black Panther, the actual scene might be a fight in an Wakandan forest but the sides might display additional forests to create a more immersive viewing experience. This idea isn’t that new. Back in the 1950s, Cinerama utilized three projectors simultaneously on a highly curved screen. And just in 2014, Barco launched Barco Escape, a three screen movie projection. However, Barco Escape situated the two extra screens in the center screens rather than on the periphery. Barco Escape also attempted to shoot movies in the format and add visual effects rather than simply using existing footage. Eventually, Barco shut down Escape in 2016. 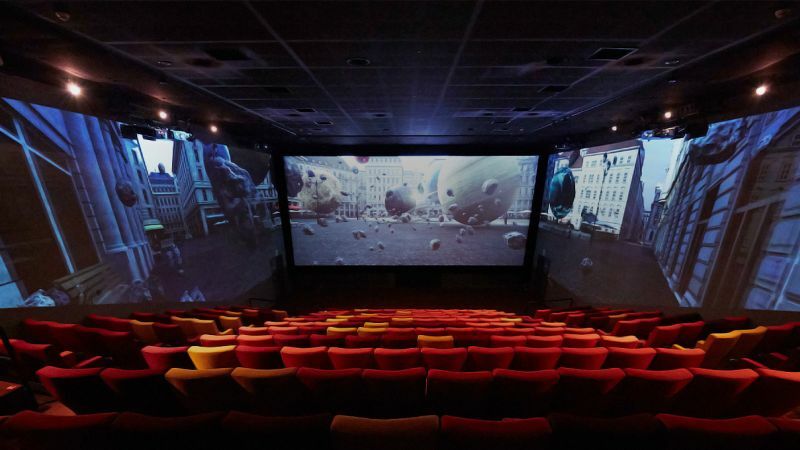 Similar to both Cinerama and Barco Escape, ScreenX utilizes multiple projectors. One projects the main center image and others project the side images. As with 4DX, there is a procedure for each film to be exhibited in the format. With 4DX, CJ codes a separate track for each film indicating when to move chairs or to disperse water. With ScreenX, a process occurs in which additional photography is collected and projected on the sides. When a ship floats in the movie, shots of the ocean (collected from an earlier part of the film or another source) and are projected onto the sides. While there are movies which shoot footage specifically for ScreenX, most blockbusters don’t. CJ scrounges up the images and melds them together itself. That allows major studios to sit back and let CJ do the work. What makes 4DX and ScreenX different from a standard show is that it can not be replicated at home. (Unless you have a friend moving your chair and throwing water at you during the movie). In addition, both 4DX and ScreenX have proven to boost attendance. In one theater, 4DX boosted attendance by over 85%. That’s why U.S. cinema chains such as Regal have installed multiple 4DX auditoriums in the past few years and are now planning several ScreenX auditoriums. B&B Theaters is also joining the fun and adding ScreenX to their premium format portfolio. U.K.-based movie chain Cineworld, which is Regal’s new owner, will bring almost 80 new ScreenX screens coming to U.S. Regal Cinemas. Since 2012, almost 150 ScreenX screens were built around the world. But CJ Group’s innovations aren’t the only premium formats expanding. IMAX is building 40 new auditoriums and upgrading 98. AMC’s immensely popular Dolby Cinema currently recently opened it’s 100th screen in the U.S. and is currently expanding to more. And with new box office records, premium experiences prepare to impress moviegoers and get them back into theaters. So get ready to chose between the largest, most interactive cinema experience that best fits your preferences. The choices are certainly expanding. And while at the moment ScreenX and 4DX are separate formats, don’t worry! ScreenX with 4DX seats is already in the making. The post ScreenX Expanding To American Theaters appeared first on ComingSoon.net.